Sitecom isn't a brand widely known in this country, hailing as it does from The Netherlands, but that doesn't stop the 300N Gigabit Router XR WL-306 from being an impressive wireless router. The cream and brown colour of the WL-306 looks a little odd in the modern home or office, but with discreet lights on the top of the box, it can be hidden away comfortably. Being compact is a nice design idea, but you will find an overly large power adapter supplied with the router, making it a bit trickier to conceal its location in the home. 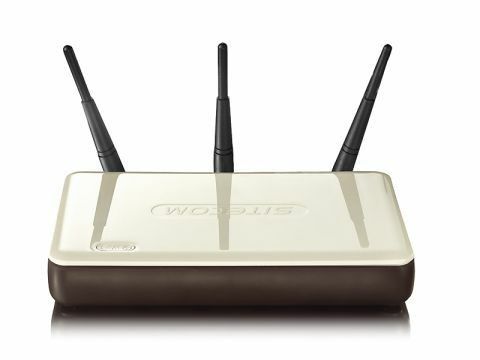 It's a compact design that's slightly larger than the Netgear DGN2000, but offers three MiMo antennas instead of two. You will also find four Gigabit Ethernet ports on the rear of this device, along with the WAN port, so you'll be able to maintain a fast wired connection, which is ideal for gaming and running high-definition (HD) content. There is only one button on the router and it is clearly labelled WPS (Wi-Fi Protected Setup). With a single click of the WPS button, all devices in the area that support the technology will be recognised and added to the network. It also sets up security, so you'll need to log the laptops in to add the final layer of security. The software is straightforward and we found setting the router up, as well as the supplied Sitecom 300N XR USB adapter (WL-302XR), an easy task. Signal strength proved adequate in a smaller building and worked well in our line-of-sight tests, with our test laptop only dropping signal strength when more than two solid walls were between the adapter and router. That said, transfer rates were also more than acceptable but, unfortunately, failed to be quite as fast as Sitecom claims. Overall, the Sitecom 300N Gigabit Router XR WL-306 proved reliable, especially if you need to set up dedicated streaming channels. It's not the cheapest of routers, however, and doesn't offer the same flexibility as the Linksys or Netgear, so we would be wary of setting this router up in a large house or office setting.